Alright, I'm a little crazy...at least my family probably thinks so when they watch me shuffle decor around the house and changing things out here and there. You see... I have a lot of "props", or home decor accessories, that I've accumulated over the years of antiquing and vintage shopping and selling at shows and shops. Thank goodness for some big china hutches and a house with quite a bit of storage. It's nice to be able to "shop" around the house for things to put new vignettes together, which is what I did for my fall mantels this year. I used my antique trophy cups (one of my favorite finds ever), natural cotton, white and mercury glass pumpkins, and hand-painted metallic painted silver pumpkins to bring this all together. As I always do when I need some vase filler, I walk down in the woods behind my house and start clipping...free and easy! I added some other green elements, amber glass bottles, and my milk paint pheasants and I have a sort of woodland chic feel...part woodsy, part shabby chic! So far I've kept the pheasant-inspired mantel for my formal living room up for now because it's the last one that I put together...which one would you pick? I love them all! Most favorite was the elegant white! Lovely options! 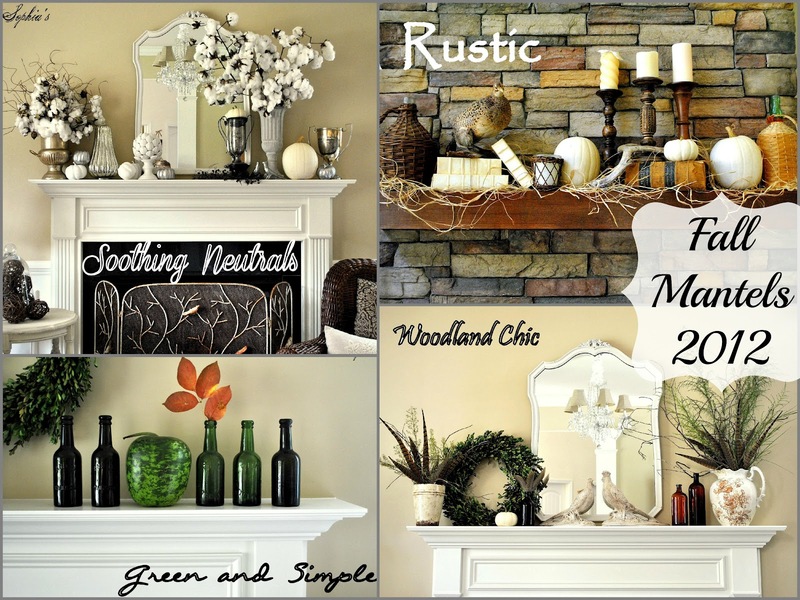 I think my favorites are your rustic mantel display and the last one with the feathers. All of these mantles are very, very lovely. Lovely enough to pin!! All of them are nice, but I like the white one best, probably because the cotton is an unexpected addition. All are gorgeous but I love white! So pretty. We raise pheasants, I've never used the feathers. You have me thinking... definitely inspired by this post! Kristen...I have not been able to do one mantel yet and you have done 4 gorgeous mantels....I love the "pheasant mantel" that you decided to "keep"...Have not made it to the Farmers Market and have never seen those apple gourds...they are fantastic!!! and so loving the cotton!! All your mantels are great but the last one really speaks to me1 Love the feathers and greens in that fabulous pitcher! The pheasants are awesome and with their slight hint of coloring like the pitcher it really makes a wonderful look! Love the one with cotton! I was just thinking today that I need to go pick some for Fall decorating. They all look wonderful! how can one choose? I wouldn't be able to decide between the neutral (1st one) and the woodland chic. Both so pretty! The next time my family thinks I'm crazy I'll tell them about your four mantles! :) LOVE the white with cotton, beautiful and unique! Oh my goodness they are all so pretty! And I love the cotton! Thanks for sharing! all your mantels are gorgeous!!! You are truly talented and creative! I have lots of cotton fields near me, but I haven't thought to use cotton in a mantel display. It looks beautiful mixed in with the silver and other neutrals. So I guess #1 is my favorite! I love love love your white mantel!!! I positively LOVE the soothing neutrals mantel! The cotton just gives it the perfect look!! Makes me miss living in the south. I am going to have to get some cotton to use in my home. Thanks for sharing!! PS I love your spoonflower post. How fun that you were able to visit!! Where did you get the natural cotton? I love it! Hope to see all your creations there! 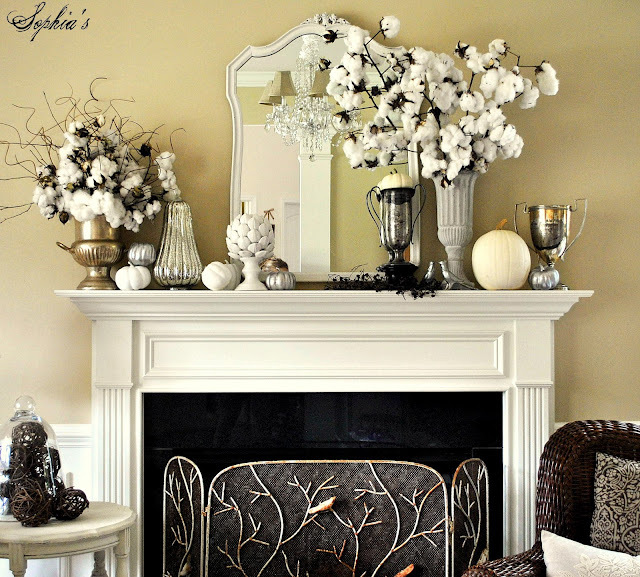 I love the colors and texture of your rustic mantel and anything with pheasant feathers tickles my fancy. 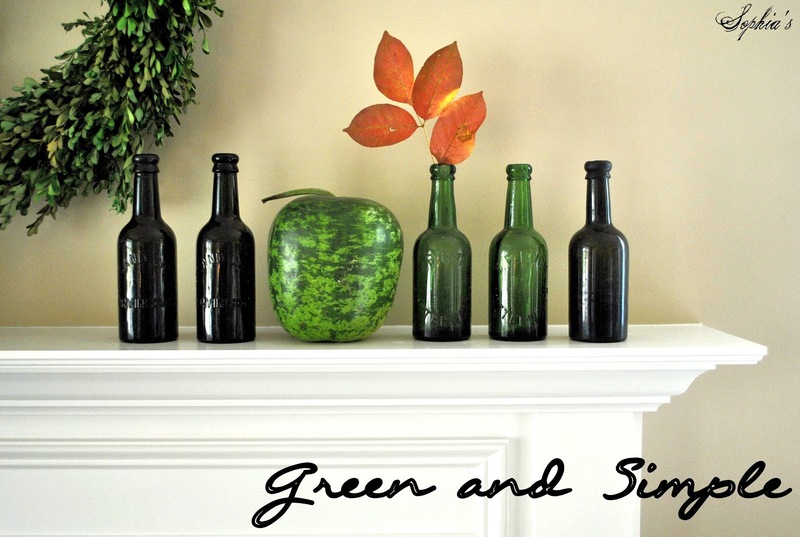 I love them all, but my favorites are the white and the green bottles mantels. Great inspiration! Stopping by from Commong Ground, Vintage Inspiration. They are all fabulous! But the neutral one is my favorite, too :) You have such a beautiful blog, I'm so happy to have found you through Debra. Happy fall! My goodness, I love them ALL ... could never pick a fave! You're so very talented! Happy Fall! I LOVE the soothing neutrals and the last one.. So beautiful!! Lucky you with two mantles to decorate! I'd love just one :) They all look great, but my favorite is the first one. I just love the play of the different neutrals together! Gorgeous! Wow I like all of them....is that possible? They all look so wonderful. Great job putting it all together. YOur home is lovely and I especially like your living room and fireplace. What a cozy place to curl up and be comfortable with a cup of coffee. It is a great home. Every single look is GORGEOUS!!! I'm in awe of how you are able to pull these looks together and you always inspire me and give me so many ideas. :-) Thanks for sharing your talent and creativity with us at Inspiration Friday! Oh these were just awesome! They were all gorgeous and I had to pin them. I like the last one the most. I also love the tobacco basket. I saw a lot of these growing up on the farm in KY. Thank you for joining me at HSH! Beautiful job(s)! You have some lovely mantels to work with. and that fireplace screen might be worth breaking in your house to steal! Argh! So glad to find you at Centsational Girl...your mantel is so pretty. Following you. So glad to have found you via the Fox Hollow Mantel Party. All your mantels are fabulous. If I had to choose a favorite, it would be the 'rustic' beauty. Of course the natural cotton sprays on the other mantel tugged at my heart as well. I have become your newest follower and look forward to reading your future posts.